But she was not prepared for what she saw that day at around 11:30 a.m.: “A room full of fifth-graders in chaos,” she recalled. Even before entering the classroom, she saw a girl lying on the ground, sticking her head out of the half-open classroom door. She asked the girl what she was doing. “I’m on lookout,” the girl said. On the lookout for the principal, Silva realized. 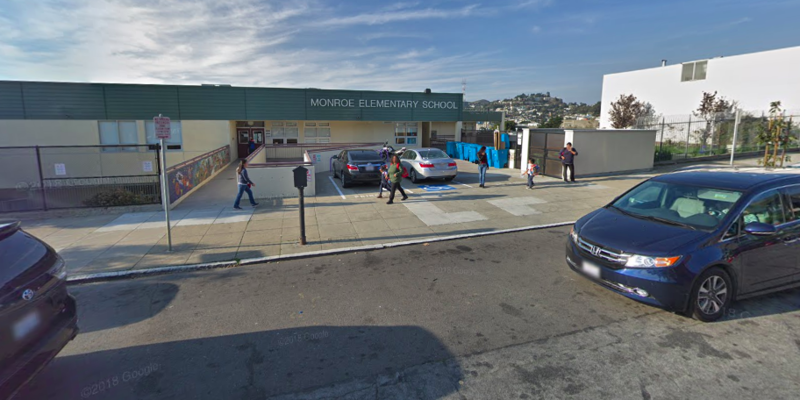 This fifth-grade class at Monroe — located in the Excelsior on Madrid Steet just up from Mission — has been without a permanent teacher since the beginning of the school year on Aug. 20 — and parents say their children were the ones to notify them about it following the first day of instruction. Not the school’s administration. The classes in question are so-called “Spanish-immersion” classes that require specially trained Spanish-speaking teachers. Some parents said they were under the impression the class would receive two Spanish-immersion teachers in the event of an oversize class. An oversize class did indeed come to pass — but instead they received zero trained Spanish-immersion teachers. Laura Dudnick, a spokeswoman with the San Francisco Unified School District, said that the district has, one month into the school year, found a permanent teacher for the classroom. Parents confirmed this; they were told that the teacher would begin on Monday. That’s not what multiple parents told Mission Local and, either way, that’s a lot of kids: The California Department of Education penalizes school districts for having fifth-grade class sizes greater than 29.9 students per one teacher, and the contract between the district and the teachers union recommends fifth-grade classes be limited to 30 students per teacher. Regardless, a number of families — SFUSD says five, parents say eight — have withdrawn their children from the school. That count includes Silva’s son, Lenin. Silva’s partner, Sue Homer, said that only a week after Silva visited the classroom, Lenin was bullied in the hectic classroom environment. “Some kids started laughing at him in back of the room and chanting his name over and over — and the teacher did nothing about it,” Homer said. So, the next day, Homer and Silva took him to a nearby Catholic school, School of the Epiphany, and enrolled him days later. “I never wanted to leave Monroe,” Homer said, “but I don’t know what else to do,” Homer said. Homer and Silva are not isolated in their frustration. A cavalcade of angry parents took the mic at an Aug. 28 Board of Education meeting and demanded a reduction of the class’ size and a qualified, Spanish-immersion teacher. “Some parents have already decided to transfer their kids out of the school, and many other parents are considering this as well,” Melissa Rosenberg, a parent, told the board. Danny Kim, also a parent at Monroe, told the school board during the Aug. 28 meeting that he, like Silva and Homer, pulled his son out of the school. On the first day of classes, he claimed, the substitute teacher made fun of his son and another student, and a student threw a pencil at his son’s eye. Many of the parents with whom Mission Local spoke said that this issue began when the school’s principal, Kimberly Mackey, opted to merge every fifth grader from three “combo” classes composed of fourth- and fifth-graders into one large fifth-grade class. A newsletter dated May 30 informed parents that the classes would be amalgamated into one class and three of the students’ teachers would be leaving the school. “Once those positions have been onboarded, we will send out notifications to our families” over the summer, it claimed. The school, apparently, could not find those teachers in time. And parents say the class has seen an ever-changing ensemble of substitute teachers since the beginning of the school year, few of whom have been Spanish-speakers. Medellin, whose four children either currently attend or once attended the school, estimated that around 16 of Monroe’s 23 teachers have left since the spring. I feel terrible for these kids. I really do. With teachers leaving the school in droves though isn’t the moral of the story that we either need to pay them a SF living wage or construct more affordable housing for educators, first responders etc.? This is, unfortunately, a perfect example of the “chicken-coming-home-to-roost” — the cascading effects of not allowing enough housing to be built in SF and throughout the nearby Bay Area over the better part of the past 40+ years. Year in and year out, NIMBY-driven anti-housing policies and a hyper-localized / balkanized ‘uncoordinated regional planning process has left us with a chronic housing shortage and the attendant runaway housing costs. We set overall/consistent educational policy at the State level — likewise, we should be setting overall/consistent pro-housing policy at the State-level — thus making certain that every jurisdiction does its fair share of housing creation. Until then, we’re going to have an increasing number of these stories as we continue to hemorrhage teachers and make life miserable for the (California) middle class. I’m so glad my son graduated last year and out of there and so was he. I was a Monroe parent for 7-8 years I volunteered for those years, I would go to PTA, I was on School Site Counsel, and president of ELAC. staff, parents and students knew me, I volunteer for 1& 1/2 years when Monroe was under construction getting kids on and off the school bus during the time they were being transported to MEC, I did yard duty for 2 years and volunteered for many other school activities. When I I voiced some concerns to the principal on behalf of Spanish speaking parents because they were scared of here because she spoke to parents in a demeaning way she was not happy. She tends to take make an example of parents that speak up as I did, her husband even got involved when he told staff I could not step on school grounds and that I had to leave even though he does not work there or work for San Francisco Unified. The principal threatened she would call police on me because I was not allowed on school grounds because they said I spoke to a substitute teacher in a threatening way and was yelling at him which was untrue because there were witnesses that observed what happened. School district needs to ask themselves why so many teachers would leave all at one time especially after being there so many years, many of us parents already know but SFUSD needs to get to the bottom of this and take action. The principal makes it a point to target parents that speak up and do not agree with her. Maybe some of the teachers who left because of the principal can step up and chime in so they can get that principal out of there. This is, unfortunately, a regular occurrence in SFUSD classrooms that serve largely minority populations. I once worked in a classroom that had remained without a permanent teacher for more than 4 months. There are complicated factors to this: classrooms that mainstream certain populations, such as students with Emotional Distubance, are more difficult to handle despite smaller classroom sizes. Oftentimes a single classroom serving minority populations can contain more than 5 mainstreamed students when there should be no more than 2 per classroom. Balancing the classroom dynamic is very difficult, and choosing which student stays in a class is usually made by process of elimination–not necessarily a choice from the school, teacher, or parent. These classrooms are often violent and scary to work in, and only highly trained teachers or teachers with exceptional classroom management abilities are qualified, which I can say most school districts are severely lacking. Also, not every parent who works full-time for minimum wage is privileged enough to remove their child from these overcrowded, violent classrooms. Imagine having your own child, who has some form of Emotional Distubance, and having him or her sent home every day for bad behavior–would you be able to work? Do you think that your employer who pays minimum wage is going to keep you or will they find someone else who can stay on the job? These parents struggle beyond what is humanly possible, suffering far more than you or I can imagine–trying to hold a job and take care of their children. I have personally known one parent who became homeless. The district is doing these parents a favor by keeping their children in class, albeit overcrowded ones. While there are regulations to help with overcrowding classrooms, there are also important guidelines in place to protect special populations, which take the form of: what is best for the student and what is best for the parent who struggles? It’s important to note that these types of discussions cannot take place in public, because it usually does not serve the best interest of parents who are more privileged. This situation is not unique to Monroe. There are other SFUSD schools in the South Eastern neighborhoods of the city that have similar vacancies right now but are not getting similar coverage. Wondering why Monroe is getting this coverage versus other schools that are facing this situation currently and faced similar situations in years past?